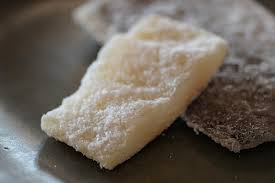 When December rolls around, many gourmands’ thoughts turn to codfish, especially salted codfish, to be exact. 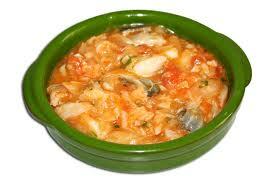 Also known as bacalao, it is a staple of many a southern European Christmas menu. 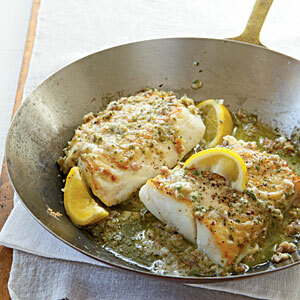 And, fresh cod, mild-flavored and meaty, is a favorite of fish lovers everywhere. Teeming schools of cod used to populate the Atlantic, so much so that this fish was one of Europe’s most important sources of protein. In Pre-Colombian days, the fish was caught in the North, preserved in salt, and then shipped throughout Europe, particularly to Portugal, Italy and Spain. After the discovery of America, fishing fleets from Europe moved westward to ply the American waters, sending their catch home, salted, although some of them, particularly the Portuguese, settled into places like New Bedford and Gloucester, MA. Cod eventually became so important to the Massachusetts economy that a wooden sculpture, “The Sacred Cod”, hangs in the Massachusetts State House. 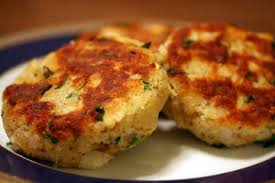 Codfish was also a cheap, plentiful staple for generations of New Englanders, with cod cakes, cod chowder, baked cod, and such wildly popular then, and still today. And, herein lies the problem. The fishery was robust, but not strong enough to withstand overfishing. Cod has been depleted faster than it can replace itself, and this has led to limits on allowable catches, jeopardizing the livelihoods of fisherman in New England and Canada alike. But people want to buy it, and the shortages create a Truth in Menu problem when consumers demand a fish that is either very expensive at wholesale or not available at all. Similar fish are often substituted for cod, both at the market and on menus, and most people cannot tell the difference, particularly when the fish has been chopped or shredded. Seafood Watch, affiliated with the Monterey Bay Aquarium, puts out of list of stable, recommended species, as well as those which are recommended to AVOID, and some North Atlantic Cod is prominent on the AVOID list. http://www.seafoodwatch.org/-/m/sfw/pdf/guides/mba-seafoodwatch-northeast-guide.pdf?la=en But, it gets confusing, because North Atlantic Cod caught in certain ways, is perfectly okay, according to their list. So, what’s a good eater to do? One important movement afoot among many New England fishermen/suppliers is to encourage restaurants to promote “fish of the day”, rather than listing cod on the menu at all, thus increasing the demand for equally tasty and more sustainable fish while reducing the stress on the cod fishery. Haddock, hake and pollack are all good substitutes, as are numerous other lesser known white fish which are delicious but not as well known. In fact, haddock has long been openly substituted for “baby cod” in “scrod” dishes. So, look for alternatives the next time you’re in a restaurant, and don’t be afraid to try something new when the server says “it tastes like cod”. And, when at the fish market, just ask if that pretty little cod fillet was sustainably fished; if they don’t know what you’re talking about, you need a new place to shop!